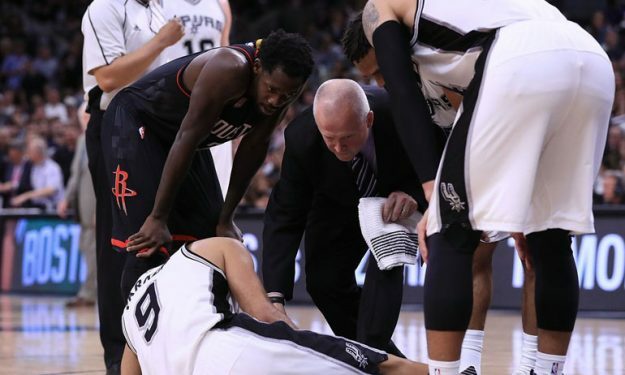 Everything was great for San Antonio, until Tony Parker was carried off the court with what appeared to be a serious left leg injury. Kawhi Leonard had 34 points, 8 assists and 7 rebounds, and San Antonio battled through the loss of Parker to beat the Houston Rockets 121-96 and even the Western Conference semifinals at one game apiece. The French star departed with 8:43 remaining. Spurs officials said the 16-year veteran will undergo an MRI on Thursday morning and will update his status after, but San Antonio coach Gregg Popovich said following the game that “it’s not good.” Parker finished with 18 points in 26 minutes, while fellow European legend Pau Gasol had 6 points and 13 rebounds as a starter and Latvian Davis Bertans added one assist. For the losing team, Swiss big man Clint Capela scored 14 points.